Since Lion has notification center built-in, I do not want to install Growl again. It would be great if I don’t have to switch between editor and terminal to see if all of my tests passed whenever I saved a file. 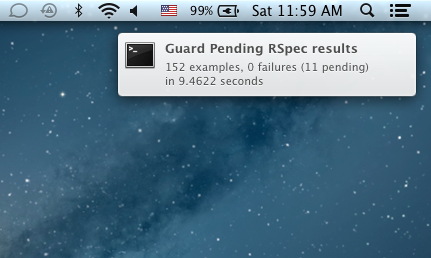 Turned out, with the latest guard with Terminal notification, I got what I wished. In case you don’t know what guard is, you should check out Ryan Bate’s Railscast on Guard. That will run your background job right away.